Create an abundance of presentations, reports, brochures, booklets and more at up to 55 pages-per-minute. With robust 4-bit color technology, the Ricoh Aficio SP C831DN prints with impressive 9600 x 600 dpi resolution for exceptional image clarity. The 250 GB HDD (optional for the SP C831DN) protects latent images stored at the printer with Data Encryption and DataOverwriteSecurity System (DOSS). The 3,000-sheet Finisher is ideal for highvolume environments that require long, unattended print runs and the ability to staple in portrait or landscape orientation. The Ricoh Aficio SP C831DN features a USB/SD card slot right onthe control panel, so users can print files from portable media with ease. 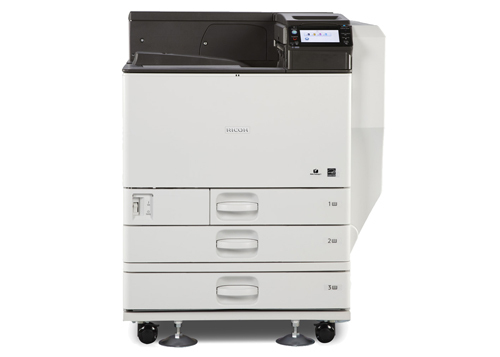 The Ricoh Aficio SP C831DN is completely user-serviceable to maximize uptime. The Ricoh Aficio SP C831DN offers seamless network connectivity with Standard USB 2.0 and 10/100 Base-TX Ethernet interfaces for peer-to-peer and shared use environments. The Aficio SP C831DN also includes optional Gigabit, Wireless LAN and parallel interfaces to meet your unique network requirements.